Hooper Schroeder’s dad runs the youth football program in Sedgwick. Schroeder has played quarterback in the Cardinals’ high-tempo, spread offense since third grade. Tenth-year Cardinal coach Jeff Werner has long seen Schroeder throw in practice and compete in drills. Entering this fall, Werner, for the first time in his tenure, didn’t have a returning quarterback or running back after all-state signal caller Brylie Ware graduated. Werner planned to start senior Grant Hilliard, a multi-purpose threat who was Sedgwick’s best option both at quarterback and running back. In camp, Hilliard and Schroeder split time. Werner didn’t want to start the season opener against Hutchinson Trinity with Schroeder, a freshman. Hilliard played in the first half. Then, Schroeder came in, and Hilliard moved to running back. Sedgwick tallied 20 second-half points and pulled away for a 40-18 victory. Hilliard threw for 151 yards and rushed for 67. Schroeder completed 11 of 15 passes for 123 yards with a touchdown and no interceptions. “Our offense was actually better,” Werner said. Schroeder delivered a strong showing in the JV game the following Monday. Since then, the two have continued to see time, though Schroeder is primarily used as the passing quarterback. 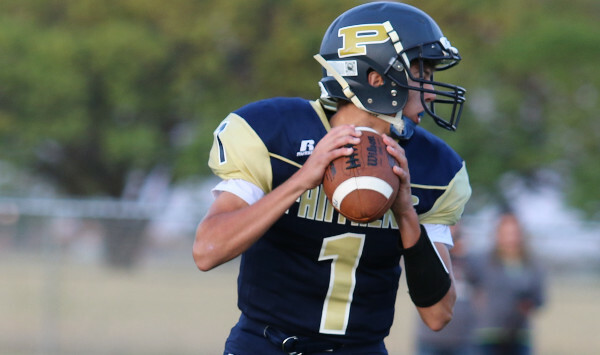 It’s an extreme rarity in recent Kansas 11-man high school football for a freshman to start at quarterback – and even rarer for the QB to flourish. Sedgwick, ranked No. 2 in 2-1A, is 3-0 and has averaged 40.7 points per contest, second best in the classification. A similar situation has occurred in Phillipsburg. Coach J.B. Covington has never started a freshman at quarterback in his first 12 years with the Panthers. Phillipsburg returned running backs Nate Prewitt (currently out with a knee injury) and fullback Brock Means. Zach Davis had run the JV offense the past two years, along with a talented offensive line. Sophomore Kirk Coomes and freshman Trey Sides emerged as the starters and split time in a Week 1, 35-0 victory against Thomas More Prep. “Trey has a lot of athletic ability,” Covington said. In Week 2, Covington had planned to play Coomes and Sides half-and-half. After a slow offensive start with Coomes, Sides tallied Phillipsburg’s only score, a great 30-yard run in the second quarter, in a 7-6 loss to rival Norton and never left the game. Coomes moved to running back. Sides led the Panthers to a 76-42 victory versus Plainville last Friday. Phillipsburg, No. 3 in the Class 2-1A rankings, is fourth in offense at 39 points a game. Phillipsburg plays host to Sedgwick in Week 6. Sedgwick and Phillipsburg have never won a state football title, though both are on the short list of 2-1A contenders for this season. The teams are looking to buck a strong trend: succeeding and playing deep into November with a freshman signal caller. From 2007-14, ten freshman have been the primary starters for an 11-man team, according to MaxPreps’ statistical archives. That group includes standouts such as Riley County’s Bryce Chavis, Leoti’s Jantz Budde, Troy’s Tristan Speer, Holcomb’s Trey Teeter, Norton’s Jace Ruder, Pleasant Ridge’s Nick Holmes, Doniphan West’s Levi Watts and Andale’s Taylor Richter. Speer, Teeter and Richter each began their high school career at a different school before transferring; Speer at Doniphan West, Teeter at Goodland, and Richter at Hoisington. As freshman, the group and their teams struggled. Collectively, the freshmen completed 492 of 1036 passes (47 percent) for 7,665 yards with a 75/48 touchdown/interception ratio for a 77.3 passer rating. The teams overall went 40-51 and averaged 23.5 points per contest with the freshmen as starters. Speer, Chavis and Ruder were easily the best. Ruder played in just three-plus games before a season-ending collarbone injury. Only three teams reached the playoffs with a starting freshman quarterback during that span. Pleasant Ridge went 4-6 in 2012. Holmes passed for 150 yards and rushed for 789 yards, easily the most by a freshman quarterback since 2007. Chavis helped Riley County to a 5-6 record in 2009. He became an eventual Shrine Bowler and is currently the leading receiver for Washburn. As a freshman, he passed for 923 yards with a 10/2 touchdown/interception ratio and rushed for 499 yards for a team that averaged 29.9 points a contest. His lone drawback was 11 fumbles. Speer delivered a fantastic line for a 9-2 Doniphan West team that averaged 30.3 points per game and reached the 2-1A state quarterfinals. He went 106 of 166 passing for 1,642 yards with a 22/3 touchdown/interception ratio and 664 rushing with eight scores. He had a great multi-sport career, including earning all-state as a quarterback career at Troy and was a two-time state wrestling champion. He was elected to the 2015 Shrine Bowl. Schroeder and Sides have each kept pace with the recent offensive successes of their programs. Sides, the son of veteran boys’ basketball coach Keith Sides, had played well in the junior ranks. Phillipsburg, 35-10 since the start of the 2011 season, averaged between 34 and 36.7 points each of the previous four years. Sides has led the team to the second-highest most points through Week 3 in the last five years. Sedgwick, 40-8 since the start of 2011, averaged 34.7, 40.8, 48, and 38.9 points the four previous years. This year’s team has a slightly different profile that previous four. The Cardinals routinely play at a high-tempo, and their average of 70 plays per game so far this season is easily their most since 2011. Its yards per play (6.0), yards per carry (5.3) and yards per catch (9.8) are the lowest since ‘11. The completion percentage (71.6 percent) is the highest in that span. Werner would like to see the offensive line gel and the running game improve. He’s pleased with an offense that’s completed a high percentage of short passes. Schroeder has completed 37 of 54 passes for 326 yards with a 5/2 touchdown/interception ratio, while Hilliard has completed 21 of 25 passes for 241 yards with four touchdowns and two interceptions. Hilliard leads the team with 51 carries for 328 yards and three scores. Schroeder has 25 carries for 95 yards. Like Phillipsburg, Schroeder has a strong supporting cast. His top seven receivers are all seniors, led by seniors Kyler Summers and Nate Werner (38 combined catches). Sedgwick’s depth allows the Cardinals to platoon many players. The defense has allowed 12 points a contest; their best since 2011. Senior defensive lineman Hunter Giffin and Matt Hughes, senior linebacker Timmy Burkholder and junior linebacker Cody Clinton have combined for 62 tackles, 29 for loss. Werner has seven passes defended. Senior kicker Jordan Scarlett, one of the state’s best, is four of four on field goals. In Week 2, Schroeder threw an interception in an eventual 51-24 victory against Remington. Because of Hilliard’s availability, the coaching staff sat Schroeder for a bit. Hilliard led the team for a score. Schroeder came back in and eventually played well.